Children are placed in age groups relative to their birth date. Those born in the years as shown below will play in that corresponding age group. You must be turning 5 in 2019 to register to play in the 2019 season. If you would like to be a manager or a coach at all during the time your child is playing soccer. You will also need to obtain a working with children certification. This does not cost you but requires you to have a NSW drivers licence and present it at services NSW. Every team needs a parent to be a manager (Admin and communication person) and Coach to organise training. If you’re new to soccer and will be playing, managing or coaching you will need to obtain a FFA# for you and/or your child. Once you have been allocated your FFA# you can then register with the club as a player, manager or coach. Make sure you select our club otherwise you may not be covered for insurance purposes. For those that don’t want to register a team we will allocate a team for your child to play in and you will be advice in due course the details of your team to decide amongst yourselves who will be your manager and coach and what night training will be. 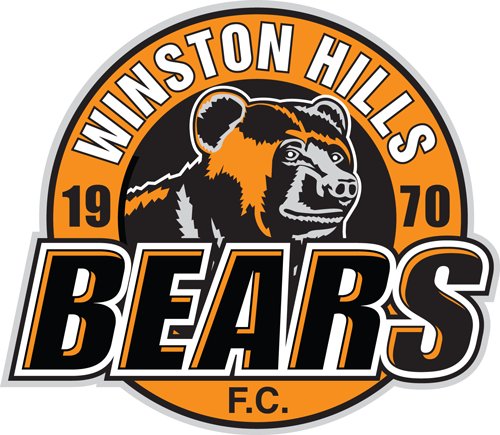 Bear Cubs play at Max Ruddock Reserve, Romulus Street, Winston Hills. Games take place between 8am and 12pm on Saturdays. Game draws are issued to each team prior to the start of the season via the Coach or Manager. Games are only cancelled if the fields get closed by council or club and may still be played in wet or cold weather. Training is to be Tuesday, Wednesday or Thursday nights between 4.30pm and 7pm and is decided by the majority of the members of your team and can be at any of our club fields. Bear Cubs are required to wear the Club Strip at all games. This is club shorts and socks, which can be purchased from the club rooms. Shin pads are compulsory at training and games. No shin pads – No play. All children with long hair must have it tied back during games. We will supply game day team shirts and these are only worn during the game and must be kept together before and after each game to limit the possibility of losing them. We will supply a basic training kit which includes balls, cones and vests. These must be kept by the coach and brought to each training session but not to game day. Team information and allocation day is the 10th of March 2019 at the Max Ruddock club house. This will allow anyone to purchase uniform pieces and collect their team kits. We will also run over our guidelines and requirements at the following times, It’s requested all teams attend this session. First game is the 6th of April 2019 and we don’t play the middle weekend of school holidays. Players allocated to teams based on either self-organised teams or club facilitation as required. The FFA’s Building Blocks Model commences with the DISCOVERY PHASE (U6 – U8), and is underpinned by the following principles. Discovering one’s (im)possibilities through trial & error. Natural development: ‘learn FOOTBALL by playing football’. No ‘coaching’ but organising fun football exercises. Replicating the ‘street/park football’ environment of the past. Other teams selected with a view to balancing team capabilities for intra club competition. 3 x 6 week-cycles with Model Sessions based on 1st Touch, Running with the Ball and Striking the Ball. Emphasis on simplicity, facilitating gameplay with fun ‘games’ providing basis for skill development. Compulsory for all: WHSC Coaches Orientation and Grassroots Certificates (club funded). Development Squad (“Senior Coaches”) should be encouraged to commence working towards Youth C Licence.